The Helaine EL 50115 is the largest and most dynamic pieces in the Helaine collection of lighting fixtures by Lite Source. 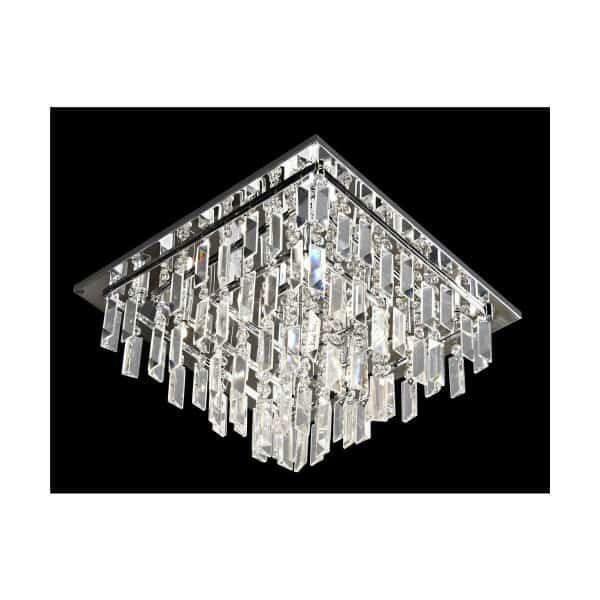 The Helaine 50115 features 9 bright lights and an arrangement of crystal droplets placed on a metal frame with a chrome finish. On the 9 Lite Flush Mount Helaine piece, the hanging crystals are separated from one another with a little bit of breathing room. This allows each individual crystal to shine and reflect the clean light and colors that are so unique to crystal lighting features. The Helaine 9 Light Flush Mount Fixture is ideal for placement over workspaces or entertainment spaces, like tables used for computer work, or areas used for entertainment like over dining room tables or as general lighting in living rooms. Old world chandeliers have no place in some contemporary homes. To capture the same glamor without breaking your style, consider the flush mount Helaine lights by Lite Source.